MSRP (CAD): $55.11 *** Please contact us for corporate pricing or login to see web pricing or US$ pricing. Alternates: 4145229 Cleaning Kit for DTC400E and C30E. 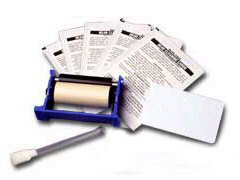 Includes 4 Printhead Cleaning Swabs, 10 Cleaning Cards, 10 Gauze Cleaning Pads and instructions. FARGO Electronics is the leading developer, manufacturer and supplier of plastic card printers. Dedicated to providing customers with quality, reliable printers for plastic card personalization and data encoding, FARGO products offer card issuers superior value through innovative designs, state of the art technology and efficient manufacturing processes.This product is designed for the following systems: DTC300, DTC400. Long Description: Cleaning Kit includes 4 Printhead Cleaning Swabs, 10 Cleaning Cards, 10 Gauze Cleaning Pads and instructions.